​This fluid keeps the tooth structure vital and flexible, creating a shock-absorber effect against fracture. While these tubules cannot be seen with the naked eye, they can accommodate several bacteria side by side working their way into the tooth toward the nerve of the tooth. Bacterial invasion of the tubules is facilitated by acid which clings to the tooth within a matrix of dental plaque. Plaque is formed when we consume sugar in its various forms. The sugar is food for the bacteria that live in our mouths. Many of these bacteria are friendly and needed by our bodies to properly digest the food we eat; however, there are harmful bacteria that produce acid as a byproduct after they eat the sugars. This acid slowly dissolves the minerals out of the enamel protective covering of the tooth. This creates softness in the enamel called decay. The bacteria are able to migrate into the tubules ahead of the enamel actually becoming soft; so when the dentist removes the soft decay, it is possible that some bacterial will remain within the tubules and become sealed within the tooth structure under the filling the dentist places to fill the hole caused by the decay. Not too long ago, I read that about 15 out of 100 completed root canaled teeth eventually need re-treatment. I think that research in the future will find that that 15 number will decrease significantly. Mainly because these newer methods of instrumentation make it easier for the dentist to properly clean out the infected nerve material so that re-infection is less likely over time. Although the materials dentists use to fill the canal after instrumentation have changed over the years, I believe there are cements I have been using for 20 years that provide very high long-term results. ​Most cements in use these days to seal the root canal are hydrophilic, allowing them to harden in the canal, even in the presence of minute amounts of interstitial fluid, into a hard-non-water-soluble material. ​For patients who have PPO insurance, we are typically in-network with your company, and in most cases root canals are covered at 80%, and buildups and crowns are covered at 50%. Healthy, natural teeth have a circulatory system inside consisting of nerve fibers and small veins and arteries that provide nutrition to the tooth and deliver a clear interstitial fluid that seeps out through the tooth structure, keeping the tooth flexible and vital. This delicate system can be damaged by deep decay, physical trauma or abrasion. If you look at the tooth structure under electron microscopy, you see that the tooth structure actually consists of hollow tubules. These tubules function as shock absorbers in that their hollowness allows them to flex microscopically… effectively acting as a shock absorber against the chewing pressures. These tubules also function as delivery systems for the clear interstitial fluid that is carried into the tooth via the arterioles. The interstitial fluid penetrates the arteriole wall and is forced as a gentle current out of the tooth through the tubules into the surrounding tissue around the tooth. This fluid keeps the tooth pliable and vital. While these tubules have a positive function for tooth health, there is a negative condition that can occur if bacteria are allowed to invade the inner tooth structure through decay, a failed restoration, or a fracture from trauma. While these tubules cannot be seen without and electron microscope, they can accommodate 6 bacteria marching shoulder to shoulder down the tubule toward the nerve. All of these tubules originate from the nerve canal and move out from there to the outer surface of the tooth. Let’s say you chew on a corn nut just right so as to cause a fracture in the enamel of a tooth. Remember, you cannot see a tubule with the naked eye; so if you can see the fracture, how many bacteria do you suppose can migrate over time into the exposed tubules and eventually reach and infect the nerve? Once the bacteria and the toxin they excrete (as they metabolize sugar) reach the nerve, they begin to infect the delicate circulatory system, eventually resulting in gangrene of the tissue within the tooth structure. Normally, this process causes pain long before the nerve actually becomes necrotic. It is important to have regular dental visits and to let your dentist know when you have sensitivity to temperature or chewing pressure. Sometimes sweet substances also cause pain. It’s important to take care of decay as early as possible so as to avoid bacterial invasion of the nerve. 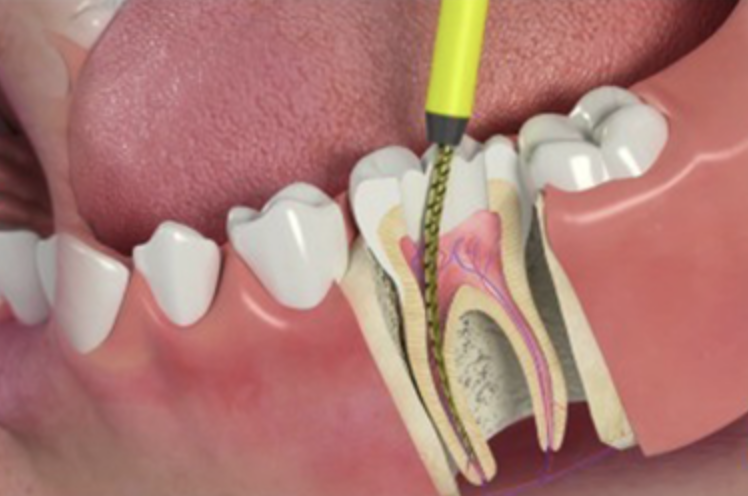 Why is it important to avoid root canal therapy whenever possible? When the circulatory system within the tooth becomes necrotic, puss normally forms and is expressed out of the root end of the tooth into the surrounding tissue. This infected puss spreads bacteria into the surrounding bone and soft tissue and the bacteria invade the bloodstream. These bacteria that enter the bloodstream from the mouth tissues is linked scientifically to several physical maladies such as arterial blockage, heart attacks, blood clots within the vascular system throughout the body, and joint inflammation for example. Infections in the mouth usually form as a result of not properly maintaining cleanliness around the teeth, which leads to bone loss, swollen bleeding gums, loose teeth, and the aforementioned physical manifestations. Avoiding infected nerve canal tissue within the teeth is important also, because one can stop tooth nerve abscesses simply by properly addressing decay and fractures early. It is important to avoid the root canal treatment also, since the root canal treatment involves removing the infected tissue from inside the tooth canals and replacing it with gutta percha which seals the canal against recurrent bacterial invasion. So when the root canal is complete, what you have remaining is a tooth void of a circulatory system. Without the circulatory system, the tooth becomes brittle and is much more prone to fracture under chewing pressure. Most of the time root canal treatment is followed by placing a crown covering over the tooth to decrease the possibility of fracture of the remaining tooth structure. Sometimes the tooth is so broken down it needs to be built up with special adhesives and composites in order to have a foundation that will support the crown covering. The earlier you address the condition, the easier it is to avoid pain during the procedure. Normally an experienced dentist can control the pain by numbing the nerve before it reaches the inflamed area. There are several methods for avoiding pain during root canal therapy. These days, modern techniques and materials help the dentist avoid pain during virtually any dental procedure; so allowing fear of pain to keep you from receiving treatment in a timely manner is simply not justified. The vast majority of patients who experience root canal therapy these days report experiencing pain relief from the procedure, with very little discomfort during the actual procedure. If you are worried about x-rays and the associated radiation, just be aware that today’s modern digital equipment emits up to 90% less radiation than the old conventional systems. If you are worried about dental radiation, please don’t fly from Los Angeles to Dallas while the Sun is shining! You receive far more radiation while flying than you receive in the modern digital dental office. It is not a good idea to put off a root canal treatment that is truly needed simply because it is not hurting you. It isn’t uncommon to observe teeth that have become necrotic without causing any pain; but the infective process proceeds as described above. Occasionally we see a tooth with a necrotic pulp that has dissolved internally and eventually collapsed in on itself without ever giving the patient any pain. This is unusual, but can and does happen. All the more reason to have periodic full mouth x-rays taken so that such conditions can be addressed and corrected early before the tooth become unrepairable. The time it takes to perform a root canal depends on several factors; how advanced is the infection? Very often, root canal treatment is initiated early enough so that the root canal can be completed in about an hour during just one visit; however if puss is being actively expressed out of tooth from the abscess contained in the bone, as the dentist cleans the canal, it might take two or three visits to deal with the cleanup of this advanced condition…. it takes time to calm these teeth down and disinfect them prior to sealing them against future bacterial invasion. ​There are many ways to determine the need for root canal treatment; and it is usually the best choice to save the tooth; however, if the tooth is severely weakened by decay or fracture, it might be best to extract the tooth and placed an implant and crown to replace it. Modern implant techniques are 96% successful long term! So it can be a better option to spend a little more now to extract and place an implant, than to restore a broken down tooth that could easily fail in a half-a-dozen years… something to consider. A trustworthy, knowledgeable dentist will properly advise you in this matter.